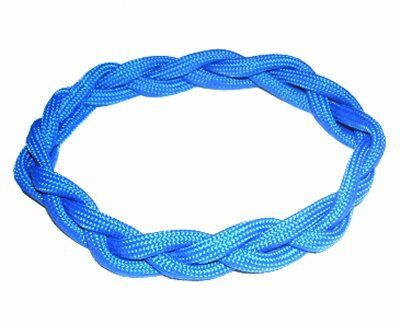 Description: The Turks Head Knot is a historical knot based on the ancient symbol for eternity, the never-ending circle. The Celtic design is typical of the interweaving patterns favored by European craftsmen. 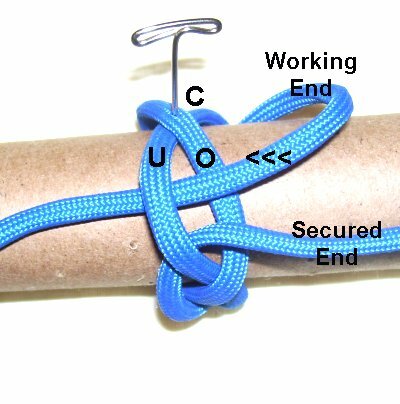 This decorative knot is a type of circular braiding that makes a continuous loop. So it's sometimes called the Turks Head Braid. It is perfect for Macrame bracelets, headbands and other projects where you need a circular ring. 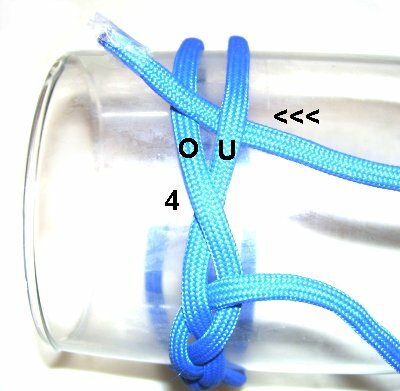 The instructions for the Small Turks Head are also on this page, since it is a related technique. 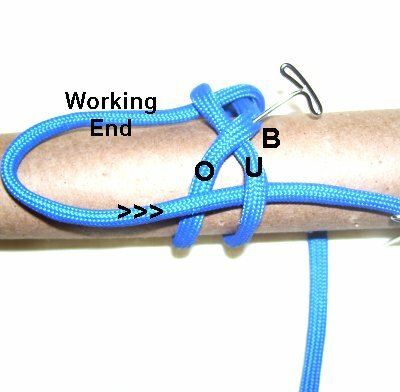 It can be used to make items like Paracord rings. 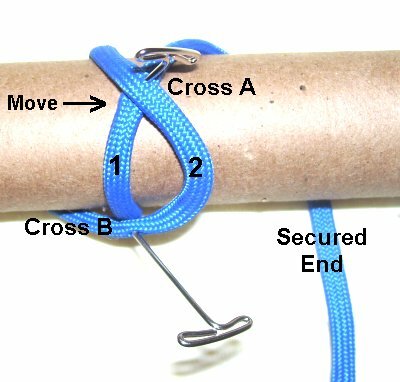 By tightening it completely you can make a button knot as well. 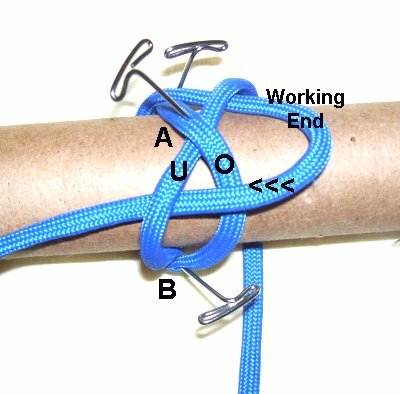 Please be sure to visit the Bangle Bracelet, which features another variation of this knot. You need an item you can use as a support, such as a glass or a thick dowel. 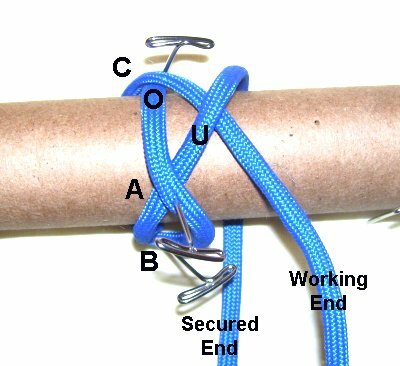 The size of the Turks Head knot will be the same as the thickness of the support. So if you want to make a ring for your finger, for example, a dowel should be used as the base (the size of your finger). 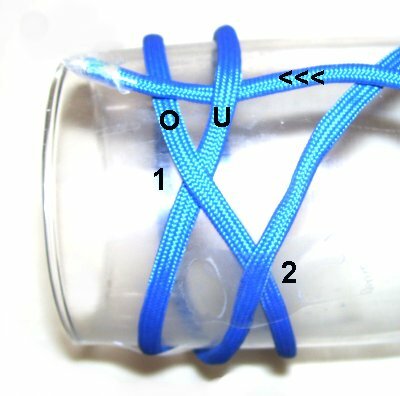 A glass was used in the example, so the knot was bracelet size. Cut one cord, at least 60 inches long. Cut the cord double the length if you plan to widen the Turks Head with the same cord. 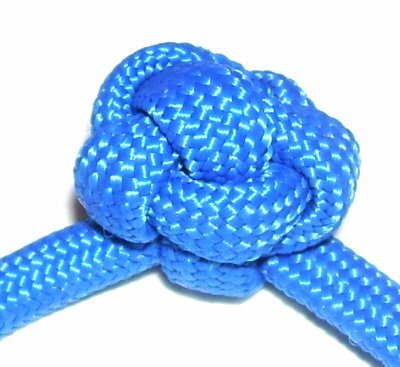 You can cut a second cord to double the Turks Head Knot, and to add a new color. Make sure you have tape available. Secure the support so it cannot roll unless you deliberately move it. Step 1: Secure one end of the cord to the lower left area of the support. Wrap the cord around, from the front to the back. Bring the end to the front again, crossing over the segment in place right to left. This is considered cross 1. Step 2: Wrap the working end around the support again. Bring it to the front, passing between the secured tail and the segment on the right. Cross over the right segment, heading left to right. This is cross 2 and it should be lower than cross 1. Important: Secure cross 2 with tape. Step 3: Move the working end up to cross 1. Move it through the area above the cross, passing under - over the two segments. It should be heading right to left. Step 4: Just above the place where you were in the last step, move the left segment over the right, with your finger. Do not flip the cord upside down. This gives you two new crossing points (3 and 4). Step 5: Move the working end through the area above Cross 3. Pass under- over, heading left to right. Step 6: Just above Cross 4, pass the working end through from right to left, under - over. Step 7: Repeat Steps 4 - 6, making new crossed areas for the rest of the Turks Head knot. Important: Try to get as much weaving done as possible, pushing everything close together as you progress. Stop when you reach the starting point, near the secured tail. Step 8: Locate Cross 2 (secured), and remove the tape. Put your finger just above it, and slide it down. Pass the end through the area above it under - over, heading left to right. Both ends are now in the same area. Move the ends to the inside, and then trim them to 1-inch. Apply glue to hold them in place. 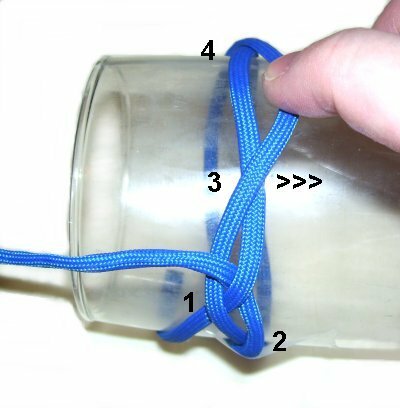 For Paracord, melt the tips to seal the inner fibers. 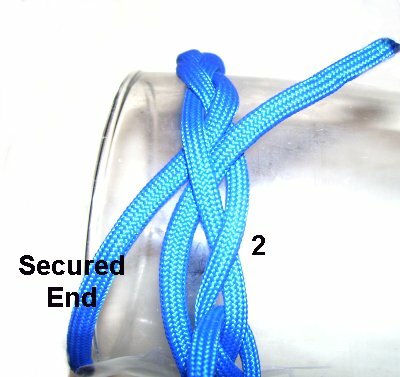 You can use the working end of the same cord to double the knot and make it wider. Just follow the path all the way through. 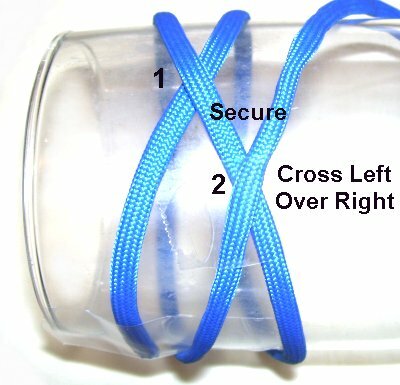 When you are finished doubling the knot, slide the ends under one segment on the inside, to hold them in place. Trim the ends and apply glue. You could use a separate cord to double the knot. Make sure you start at the secured end. To finish, slide the ends under one segment on the inside, to hold them in place. Trim the ends and apply glue. 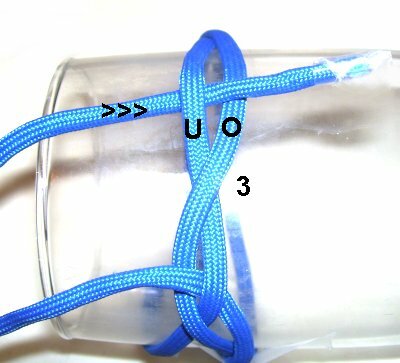 This variation of the Turks Head knot is actually a shortcut, and is the best technique to use when making Macrame rings and other small items. You need 1 cord, at least 36 inches long, to practice. You also need rolled up piece of heavy paper or cardboard tube, slightly larger than the size of your finger. Consider this to be the equivalent of a project board, since you will be securing the cords to it with pins or tape. Step 1: Secure one end of the cord under the tube, on your right. 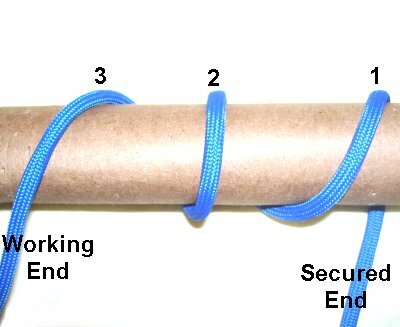 Wrap the working end around 3 times, moving towards the left. Make sure the end is in the front when you finish. Mentally number the three segments. Step 2: Move segment 2 over segment 1, heading left to right. This will form two crossed areas, one at the top (A), and another at the bottom of the tube (B). Secure both crossed areas to the paper tube. Step 3: Move the working end (segment 3) to the right, passing over - under the two segments above cross A. This creates the third crossed area (C). The portion you pass under leads to the secured end. Step 4: Roll the tube slightly, so you can see the area just below cross A. Move the working end right to left, over - under the two segments. You can now remove the pin on cross A. Step 5: Roll the tube away from you so you can see the area below cross B. Pass the working end over - under the two segments, moving left to right. Remove the pin on cross B. 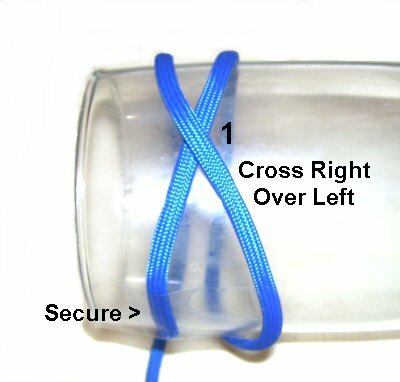 Step 6: Move the tube again and find the area below cross C. The secured end rests in that same area. Pass the working end through over - under, moving right to left. Step 7: Tighten the Turks Head knot to the size you want. For a ring, you will need to trim the ends and attach them on the inside with glue. To make a Button knot, tighten it slowly and carefully, until the design is round and firm. 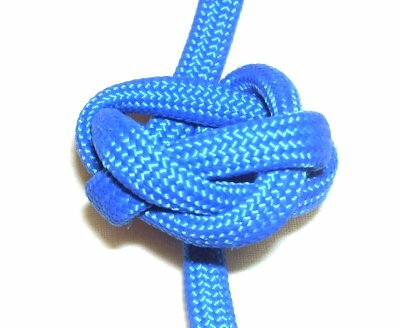 Have any comments about the Turks Head Knot? Contact Me.